Speed test! Five PC clean-up utilities: Do they really work? I’m always suspect of programs that claim to make Windows run faster. Windows 7 and 8 don’t need a lot of help in that regard, and in the past some optimizers have messed up my system. But darn if Ashampoo’s Winoptimizer 11 doesn’t provide some facilities that made my system run faster, albeit by a small margin. But even a small margin is welcome, and the program gathers a ton of useful features under one roof, facilitating an easy tweaking and optimizing experience—something you might not get around to if you stuck with the myriad freebies. 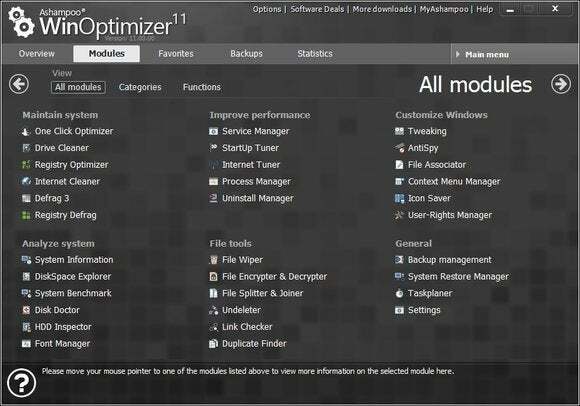 Winoptimizer11's modules are myriad and all available separately, as well as being employed in combination by the program's various wizards. 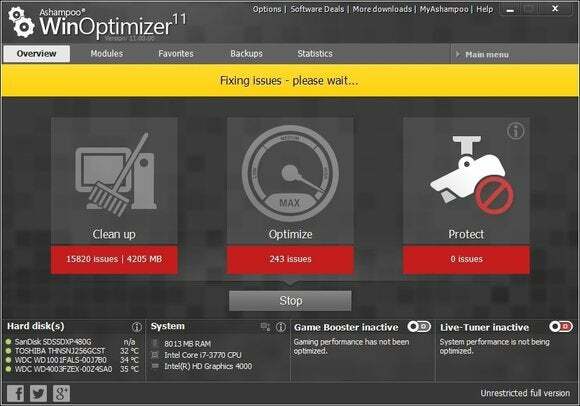 Winoptimizer 11 has a host of other tools. Some such as file wiping, splitting, joining, encryption and decryption; duplicate file finding; and registry defragging are very handy and not available within Windows. Some duplicate Windows functionality, like the font manager, program uninstaller, and process and service managers. However, having them all in one place can be a real time saver. Most are also just a touch easier and more capable than their Windows counterparts. Also, unlike the built-in Windows utilities, there’s an undo for most actions found under the heading of backups. And it’s not just for the last action, there’s a list of changes you’ve made over time. Winoptimizer 11 also provides a nice tweaking utility so you can customize many aspects of Windows, including Aero behavior, as well as the behavior of common applications such as Outlook, Mail, etc. There is a real-time gaming booster that shuts down unnecessary processes while a game is running and restarts them when you’re finished, as well as a live tuner that optimizes memory and application priorities. The first I can see as being possibly handy, the latter is one of those tasks I’d rather leave to Windows. To be honest, I didn’t notice a real difference with either running. One speedup that did have a noticeable effect was the number of simultaneous HTML connections in browsers. Increasing these, as Winoptimizer 11 decided to do with its main optimize wizard (you can access modules separately), had a definite positive effect on the speed with which Web pages loaded. Especially those with lots of embedded content (ads, pictures, video, etc.) relayed from other sites. Winoptimizer 11 is a very comprehensive set of Windows utilities that works very, very well. The $40 price tag might seem a tad steep when its functionality can be largely duplicated manually (with a large set of the proper knowledge), and with freebies such as CCleaner and the Windows defragger. However, the convenience of everything under one roof, and the ability to tweak Windows without being tech-savvy, will be well worth it for many users. There’s a trial. Kick the tires. Though you can do much of what it does with free utilities and Windows apps, Winoptimizer is far more efficient and better at most of it.